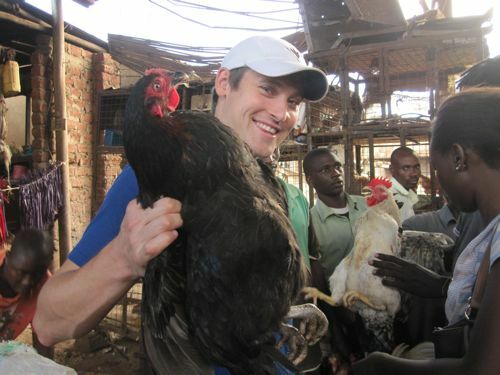 Uganda- words don’t really do this place justice- it’s more of a feeling – for the place and most of all for the people. 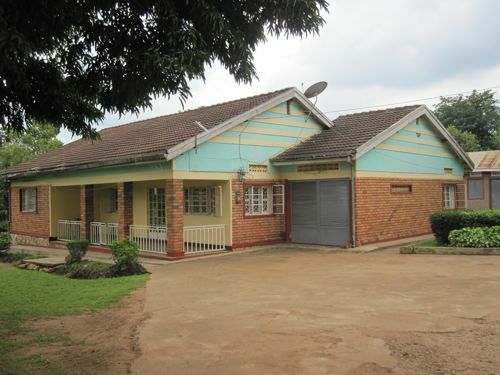 We arrived in Kampala, Uganda and were met by our family friend Dr. Michael Okwakol who greeted us warmly at the Entebbe airport and invited us to stay in his guesthouse behind his family’s home in Bweyogerere just outside of Kampala. We really enjoyed meeting his family for the first time and sharing daily life with them for the next two weeks. We are so grateful for the Okwakol’s hospitality and generosity. The oldest daughter of the family, Martha had just returned to Uganda from the US and was a great friend as we were all “transitioning” into Uganda. She brought with her Kailey, her niece (age 3) to have a visit with her grandparents. Also living at home was Lillian the 3rd of the 5 children. 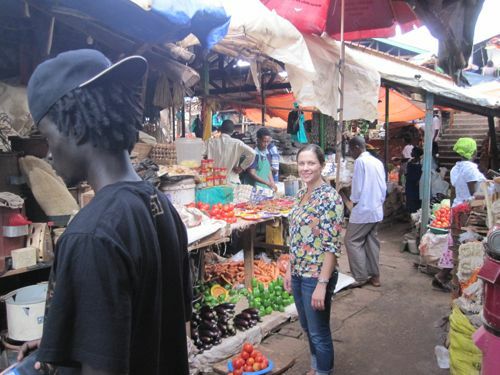 Lillian was so generous with her time showing us around the city and making us feel comfortable at home. We had so much fun hanging out with Lillian and her fiancé Giovanni. 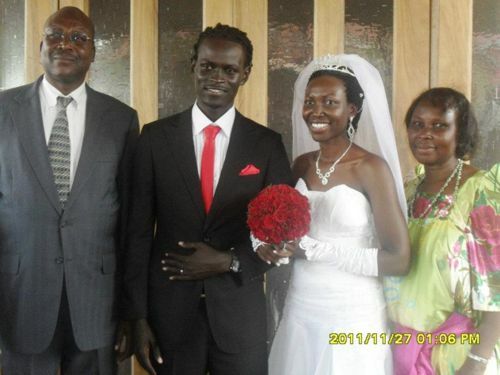 During our time in Uganda- these two got married! It was so special to get to share this day with them. They are an amazing couple that we hope to keep in touch with for years to come. 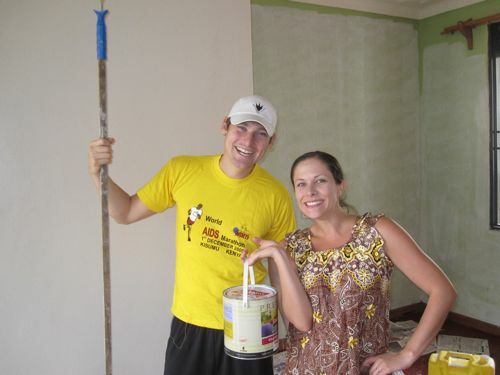 Before the wedding we helped them paint their new apartment and went to the main market with them to stock their pantry with staples rice, beans, flour, popcorn, etc. They purchased a small charcoal stove and will add to their kitchen as they can. Kitchens aren’t included when you rent a place. There is a room with a sink. No counter, no stove, no refrigerator- you have to bring your own. Most people in Uganda cook outside. 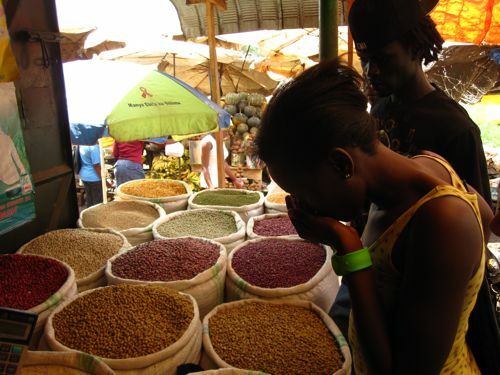 The best thing about staying with the Okwakols was having the opportunity to experience typical life in Uganda. Without their guidance and wealth of knowledge and insight we would have had no idea what to see or try or how to quickly manage ourselves around the city. Because of them, in just a few days we knew the system to buy local street food, we felt comfortable jumping in a taxi and speaking a few words of the local language Luganda to get us where we wanted to go. We knew the words for local foods to order at a restaurant and how to pick a live chicken from the market. 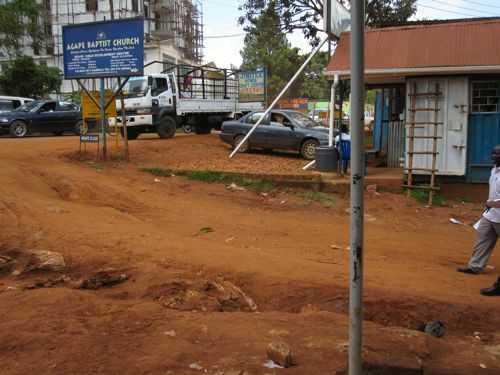 Pat learned how to drive on the interesting roads of Kampala, how to avoid potholes and how to get unstuck in the muddy ditches. We had help knowing if we were getting a fair price for things. We got the local scoop on what scams to protect ourselves from and where and what was and wasn’t safe. We learned when to put our mosquito net down in the evenings to best protect ourselves from the critters. We got a taste of the typical pace of life and the small frustrations that you have to factor into every day when living in Africa. We were introduced to numerous new friends and family and were warmly welcomed to their part of the world. The Okwakols patiently answered our every question about all of the things we were seeing for the first time and were curious about. Giant Green Bananas? Matoka. They are cooking bananas that turn into something much like a starchy potato when you eat them. I think they are very similar to an unripe plantain. Taxi? 15ish passenger vans that have a conductor shoving people in the back and repeatedly yelling the name of the town they are headed to. You get off where you like- if you can get them to stop there. They have a route similar to a bus usually. Sometimes they change their mind mid-route and go somewhere else… just pay attention and hopefully you’ll get there. We only had once incident where we ended up walking a mile back because we couldn’t recall the correct word to ask for a stop. We kept repeating what we thought was correct- but it ended up being the word for nurse instead of stop. Live and learn. Boda- Boda? The motorcycles on every corner waiting to give you a ride anywhere. More expensive than a taxi but, much faster in traffic. They wreck often- so you have to evaluate the benefit before hopping on. We ended up using them quite a bit. Sometimes Pat and I would share one boda with the driver. If we had luggage or were going a long distance we’d each hire our own. 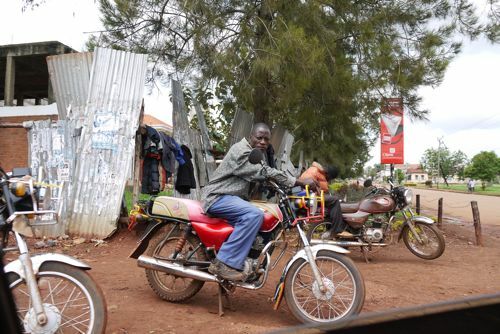 Most women in Uganda ride on these motorcycles side saddle and hold the seat. I straddled the seat and held on tightly to the driver. My first few rides I accidently goosed (squeezed) the drivers when they got going too fast- usually this resulted in laughter and them slowing down a bit. The term “boda-boda” came about when Idi Amin was ruling and people needed to get out of the country quickly so they would say “border- border” – as in take me fast to the border of the country and the local dialect name stuck- “boda-boda”. How do the beans taste so good? Boiled for many hours then fried with vegetables for seasoning. The juice (which they call soup) is added back for liquid to mix with your rice or posho. Another power outage? “Load Shedding”- there isn’t enough electricity to power the country so they switch portions of the country off for periods of time on a rotating basis. The official schedule isn’t kept- so you may or may not have power today or tomorrow… but it usually comes back on within 24 hours. And goes off again within 12. Major frustration for work and cooking. Even worse for hospitals and red lights. Why do I keep hearing people scream “muzungu” when I walk by? 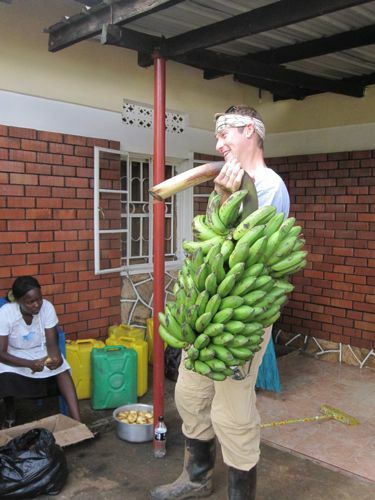 Muzungu is the name for “white person”. It’s not a derogatory term- just descriptive. Children most of all say it repeatedly when they see us. Some small children aren’t use to seeing muzungus and will cry or freak out if you get too close. Most are just happy to see you and smile and run to hold your hand or feel your hair. Adults will also use it to get your attention when speaking to you. 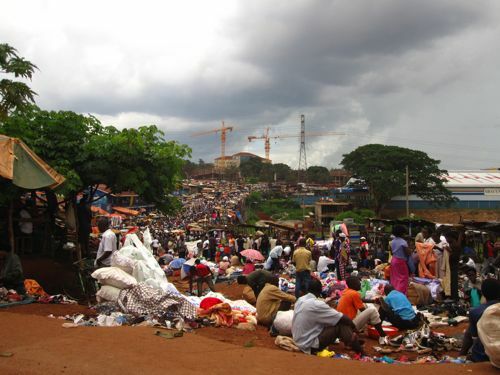 Kampala- It’s lush, it’s green, the soil is red, banana and palm trees grow everywhere. The roads are full of potholes. It’s on the equator but has a high elevation so it’s not as hot as you would imagine. There are 2 seasons- rainy and dry. Sections of the city are developed with traditional modern buildings. 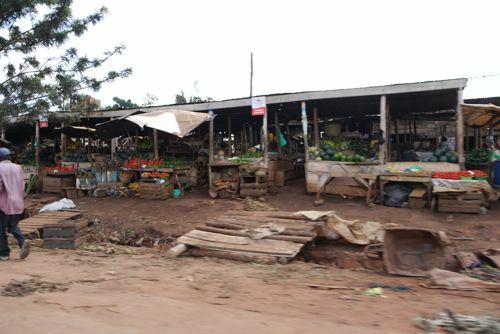 The majority of shops are housed in pieces of shipping containers on the side of the road. There are a few indoor supermarkets. 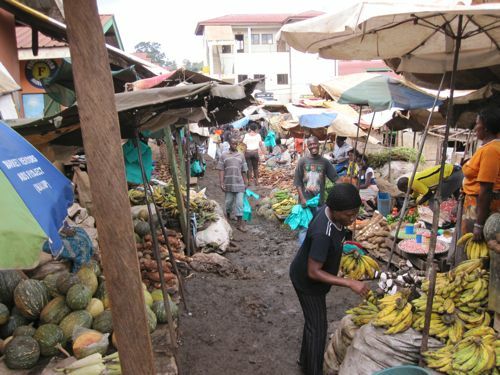 There are mini outdoor markets and individual stalls selling produce all over town. There are no McDonalds or Starbucks. It is almost impossible to find trash bags to purchase, everyone just burns their trash and packaging barely exists. Coke comes in glass bottles. Homes plots are fully surrounded by fences with gates with sharp glass or wire on top for security. Conveniences like washing machines and microwaves are available if you can afford them but most middle class families wouldn’t have these luxuries. Water is limited, the city will turn it off randomly. Men make bricks by hand and cook them inside homemade mud kilns on the side of road where they also are dried. Children wear uniforms to school, which sometimes is a deterrent for some to get to go because of the cost. Hospitals don’t provide meals or blankets you bring your own. 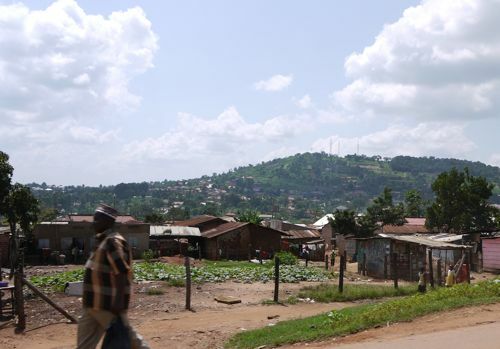 Uganda is a beautiful place in many many ways- but it’s not an easy place. 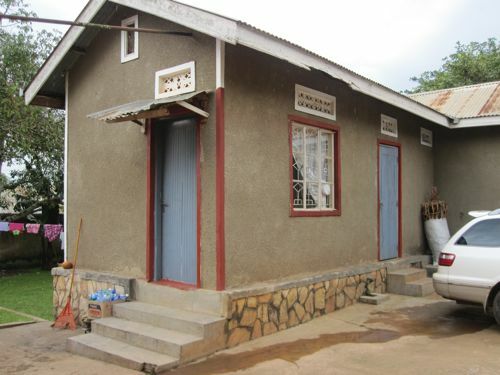 Dr. Okwakol is the Senior Pastor of Agape Baptist Church in Ntinda. 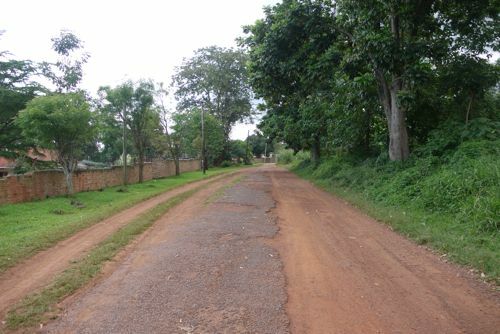 This is just outside of Kampala. We really enjoyed Sunday worship at this church. The people were wonderful and such a delight to get to know. Even in the short time we were there it was easy to get to know the “core group” of the church- those that were there if the doors were open. 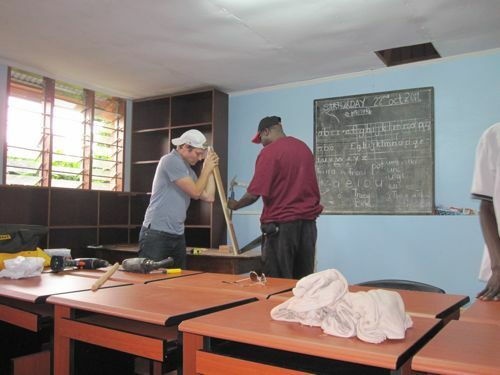 While we were in town we helped to paint their educational space (Sunday school rooms and computer lab). 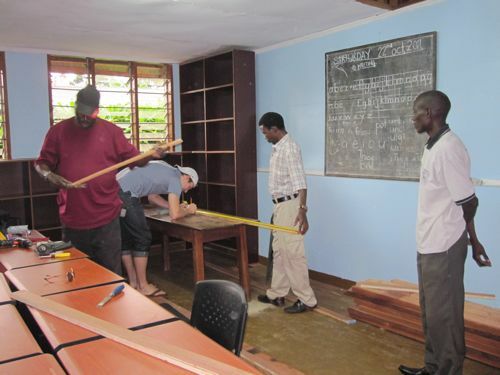 We also worked to complete their new computer lab. 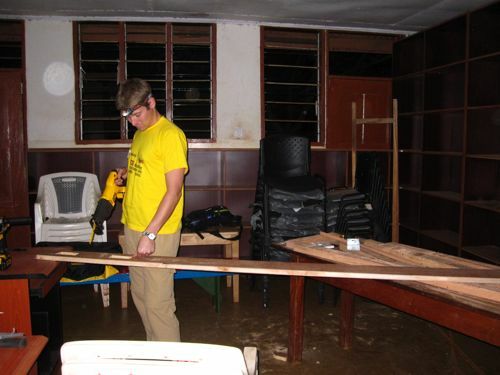 In collaboration with Compassion, they were able to receive 20 computers and needed assistance getting the wiring boxes built and it all set up. Eventually children and adults in the community will be able to learn computer skills and have internet access while connecting with the church. 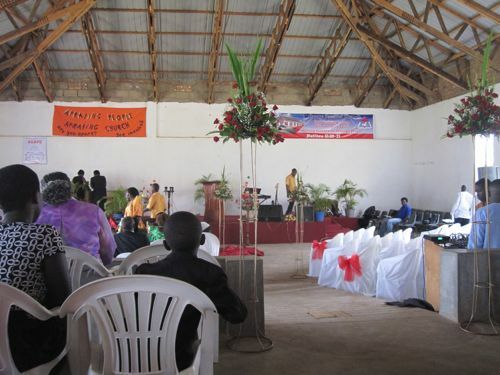 On Saturdays, the facilities of Agape Baptist Church are used by Compassion International to house a weekly program for children. Once accepted, the children are enlisted in the program and are sponsored by individual international donors. 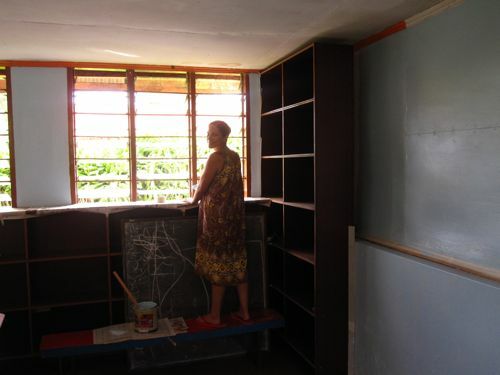 The funds provide for the kids primary school fees and additional support through staff. Pat and I were able to participate in the Compassion program on Saturday by each assisting with a group of kids during their lesson time. During the weeks we ventured out to learn about several other organizations. One of these is Water School (www.waterschool.com) an educational program teaching villages how to treat their water to be safe for consumption. The method, which has been proven to work, uses only UV rays and plastic bottles. The process is easy and safe once accepted, but the process of education is the hurdle to overcome in villages. Because this doesn’t produce any income it is fully funded by donations. The program targets children and community leaders to drive innovative change. In this part of the world, water can be made safe for drinking by filling clear plastic bottles with water, placing them in homemade racks on the roof of a hut, and allowing the sun to shine on them for at least 12 hours on a clear day. There are details to consider like scratches on the bottles and cloudy days- but overall it’s an easy process to complete. If only people knew how and to do it, so much illness could be prevented from water born disease. Posho- corn flower and boiling water until firm. Served everyday in schools. Chicken on a stick- cooked over charcoal fire in the street. On a stick- not a skewer. Passion Fruit- tart fruit with fruity goo covered seeds inside. Jack Fruit- enormous green spiky fruit with a sticky yellow middle- you peel the sections out to eat and remove the seed from each section. It tastes like a combination of rubber and unripe mango. Pretty good actually. Peanut butter- called “G-nut” -ground nuts, nothing added- much drippier than JIF. Great pics & blogg as well. It was nice hanging with you guys. and it feels good knowing that you had fun in Uganda. Thanks Giovanni. You guys rock! We so can’t wait for you and lilly to come visit us in the US 🙂 Keep us posted every now and then with what is going on with ya’ll. Miss you two!